Lorelai: I know there's more to the story than you're telling me. [...] I've read every Nancy Drew mystery ever written, the one about the Amish country twice. Late in the Gilmore Girls’ final season, in an episode called “I’m a Kayak, Hear me Roar,” Lorelai announces to her mother that her short-lived marriage to Christopher is over. In the moment, Emily is flustered not so much by the announcement as by the fact that she’s struggling to put Richard’s papers in order while he’s recuperating from a heart attack. All her life, she tells Lorelai, she fulfilled her role as his wife. He managed the finances; she organized their home and social life. It’s a good system, she says, as long as there are two people involved. She likens it to being in a canoe. Both have their own oars. The problem with this two-person system arises when one oarsman is incapacitated, leaving the canoe to go round and round in circles. As Emily watches Lorelai navigate Richard’s mystifying (to Emily) computer system, she notes that Lorelai is a kayak: She has control of both oars and thus can steer herself. “You’re independent,” Emily marvels, to which Lorelai responds, “I’m a kayak, hear me roar” (hence the episode’s title). Emily rests her hand comfortingly on Lorelai’s shoulder, looks her in the eye, and says, “You’re going to be fine.” Even without a husband. Emily's unexpected warmth and support (which may be helped along by alcohol, it should be noted) catch Lorelai off-guard. And us too. Emily’s "highly cultivated garden" of a life is revealed to house a rarely-seen patch, where maybe the borders aren't so neat, the flowers not so delicate. Perhaps believing this moment will herald a breakthrough in their relationship, Lorelai is deflated to wake up the next morning to an Emily as frosty and passive-aggressively judgmental as ever, as she primly sips her coffee from a well-crafted cup and flips through the morning paper. This episode’s tension between the well-ordered exterior and the unexpressed complexity within is threaded throughout the series. It’s on full display in the season one episode "The Break-Up, Part II,” in which Dean has broken up with Rory, and she won't reveal to Lorelai the reason: Rory can't tell Dean she loves him. Like her grandmother, like her mother, maybe like all of us, Rory keeps a part of herself hidden—from Dean when she can't tell him she loves him, from her mother when she won't admit the fear she felt when Dean confessed his love. And that’s how it is, isn’t it? There’s always more to a story than the story we see in any one moment. We’re all amateur sleuths improvising our way through this life. Back in "The Break-Up, Part II,” when Lorelai is trying to extract from Rory the reason Dean broke up with her, Lorelai invokes Nancy Drew. It’s an apt analogy given how the books are structured. Nancy always solves the mysteries but not necessarily because she knows the full story behind the perpetrators’ motives. Those may not be revealed in full until after the criminal is proven guilty. 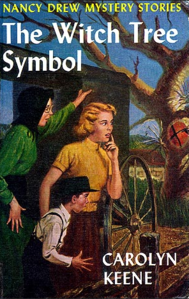 So it is in “The Witch Tree Symbol,” the “Amish country” book Lorelai refers to in the quote that opens this piece. In the story, Nancy, alongside her loyal sidekicks Bess and George (a girl with a boy’s name), investigate the theft of antique furniture. The case brings the trio to Pennsylvania Amish country, where the criminal may be hiding with the stolen stash. Watching “I’m a Kayak, Hear me Roar” alongside season one makes me think about why Lorelai might have read “the one about the Amish country” twice. Early in their investigation, Nancy, Bess, and George stay with an Amish family, the Kreutzes, whose daughter Manda has gone missing. Watching Nancy at her work, Mr. Kreutz laments of her, "Such a nice girl. I cannot understand why your papa lets you do things like this. You should be home cooking and cleaning.” Bess jumps in to tell him about Nancy's "fine accomplishments": "'She's restored lots of people to their families,' Bess explains, 'and brought others peace of mind.’" After a moment of silence, Mr. Kreutz then asks Nancy to please find his daughter. She does, of course. And saves two boys from being crushed by a beam. And solves the original theft that brought her to Amish country in the first place. Her heroics prompt one Amish man to tell her, “you have made me see that a girl does not have to be brought up like a pioneer to be courageous and helpful to others.” That’s as close as we come to a reconciliation between Nancy’s “sleuthing” and Amish culture, which the novel doesn’t judge in an overt way. In the end, Manda reveals that she’s found a nice man her father will approve of, so there’s that problem solved. "Becky followed the group outside with a wistful expression. Her mother had already laid out some work for the girl to do. Oh, that “wistful expression” though ... I can imagine Lorelai relating to Becky’s longing, and perhaps being slightly haunted by it.